Music Streaming business is tough…very tough, especially in Indian market. Lot of biggies (including Google) have tried it and failed. Even with smartphone numbers increasing sharply in India, and music streaming apps being popular, it has been a tough turf to make money. However, no telecom operator has made a foray into it, until now. 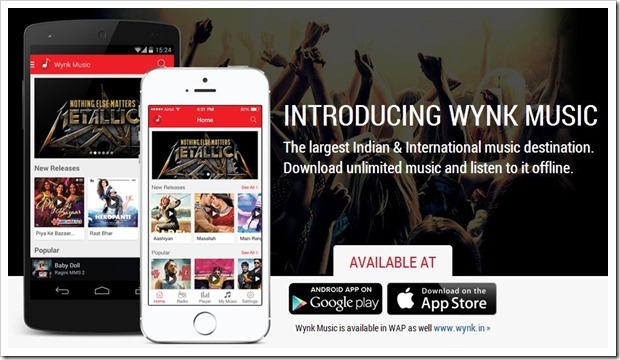 Bharti Airtel has now launched “Wynk Music” mobile music streaming app that offers millions of free Bollywood, Regional and International songs to users. The app is currently available on Android and iOS. Interestingly, the Wynk music app is not monetized through ads. App users get a ad-free music streaming experience for over 1.7 million songs. However, if you wish to download the songs for offline-listening, you will need to make purchases. Wynk music app has all the features you would expect from a streaming app which includes filtering and finding songs by genres, artists and moods, creating your own playlists, internet radio etc. The app is available in English and Hindi. As far as streaming quality goes, the music is offered in High (128kbps) / Medium (64kbps) and Regular (32kbps). 256 kbps VBR quality does not seem to be available. In-app music purchases can be made for single songs or entire albums. The app also has Wynk Plus subscription model where users can subscribe to unlimited music downloads for Rs. 99 per month. Wynk Plus is currently available free for 1 month as a trial offer. If you are an Airtel customer, you can avail Wynk Plus for only Rs. 29. Payments on Wynk can be done through net banking, credit or debit cards. Carrier billing is available, but only for Airtel customers. Wynk also has another service called Wynk Freedom, which is priced at Rs. 129 per month. The advantage with t his service is that users will not need to pay any data charges. But this service is again available only for Airtel customers. Issues with Downloads on other Networks / Devices? We wanted to test the app and we tried downloading it, however, we just could. We got an error stating that app is incompatible with all of your devices. We tried downloading on Nexus 4, which generally does not have problem with any other apps, but with Wynk it just did not show up on play store. While we are discounting it as the app is new and may have some teething problems, if these kind of problems persist than they may lose out of lot of downloads. Will Wynk be a Success? As we could not use the app ourselves, we looked at feedback given by existing users. Most of them seem happy with the interface, which looks clean and fast. Number of commenters mentioned that app has limited collection, especially for old hindi and classical songs. I think over period of time the collection will improve. The most important question however is, whether Wynk will be a success? We think it has much higher chance of becoming a success compared to others because it will benefit Airtel directly as well as indirectly. Firstly, Airtel has a readymade customer base of over 200 million subscribers in India for whom the prices are very low. Because, carrier billing option is available, many users will tend to make in-app purchases as well. On the other hand, music streaming will increase data usage on their network which will bring additional revenue to them. The biggest advantage however will be that the music library will be kept on Airtel’s own servers, so they are not going to incur additional costs of hosting music elsewhere and then streaming it. The music streamed will utilize their own existing network! Like we said earlier, Wynk is a great move by Airtel, and chances of it becoming a success are quite high! Give it a try and let us know what you feel! "Wynk Music, Airtel’s New Cross Platform Ad-Free Unlimited Music Streaming App", 5 out of 5 based on 1 ratings. I had installed the app, and tried streaming some songs.. Worked fine. I tried downloading, and subscribing for a plan. I do have an airtel internet plan, and still, it couldn’t recognize it as being an Airtel Internet plan for a discounted fare. Also, Another issue was that it DEFINITELY NEEDS the credit card number, regardless of having a Paytm portal where payments can be made out of the wallet. Why is that necessary? Hi! We are only restricting devices running OS version lesser that 2.3 and based on country (India, Bangladesh, Sri Lanka). Could you share the exact reason that you got when you clicked on the install button. For apple users, it generally shows that the app is not available in the US store, and it prompts to change to the Indian store. If you are still not able to download, please let us know. App is available only on Indian play store. See if you are logged in to Indian play store on the device.